More than six years ago Tanner Richards headed his own accounting firm and enjoyed a six-figure annual income, but his wife’s death in an automobile accident left him with a determination to live in the moment and a need to spend time with his two young children, then three and five. He sold his business and moved his family to Crystal Falls, Oregon, so that his mother could help with the children, and he took a job as a deliveryman for Courier Express so that he would have more time with Tori and Michael, now eight and eleven. For the past three years, he has enjoyed a plum assignment on a rural route that allows him to be home by the time his kids are out of school. He has developed a genuine fondness for some of his regulars, particularly Tuck Malloy, an octogenarian, rough-edged former rancher. When Tuck, who has landed in an assisted living facility after a fall that left him with broken bones and required hip-replacement surgery, calls and asks him to smuggle in contraband beer and chewing tobacco, Tanner knows it is unwise but can’t deny the old man his pleasures. Crystal Malloy is struggling to keep her upscale beauty salon functioning at optimum level and to care for her grandfather and Rip, the Australian cattle dog who is her grandfather’s boon companion. Tuck is the one person who has always been there for her, and she is determined not to fail him. She is doing all she can to prepare for the time when he has recovered enough to move into her home, but in the meantime the level of help he requires means an assisted-living apartment is the best place for him. Crystal panics when the rigid, mean-spirited administrator threatens to evict Tuck because of his beer and tobacco. She allows herself to be blackmailed into filing an official complaint against the deliveryman who brought the contraband. Tanner and Crystal meet when he is demoted to a Mystic Creek route. An apology and the withdrawal of Crystal’s complaint prevent any antagonism between them. There is no reason they cannot act on their immediate attraction. They share a commitment to Tuck, basic values, and an unpretentious approach to life, but both are wary of long-term commitments, Tanner because of his kids and Crystal because of the trauma in her past that has left her terrified of love. Meanwhile, Tuck has found a romantic interest of his own and the confident, take-charge Essie has shown him that life in assisted living can be more rewarding than he thought possible. These relationships play out against a background of warm community, the complications of family, and pets with personality to give readers a rewarding, feel-good read. Anderson’s fourth Mystic Creek book is a strong addition to the series. There’s a lot going on in this book, and the pace may seem slow in the opening chapters. But the characters are endearing enough to make these concerns small ones. All the adult characters bear scars, but Crystal’s problems are complex and deep-rooted. They are not rendered simplistically. Nor, despite the suggestion of an HEA, are they resolved with a single, miraculous counseling session. 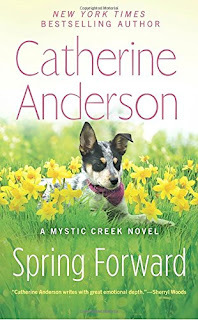 Anderson makes it easy for readers to become invested in the lives of her characters and to root for their happiness. I think the lingerie-stealing burglar could have been omitted with no loss, and I thought the “spring forward” theme was rather overdone at the end. Nevertheless, overall, I found this an engaging read. It can easily be read as a standalone. I recommend it for fans of contemporary romance with more sweetness than sizzle and lots of family and community contexts. I haven't read anything by her in a while. I should probably start at the beginning.